This lecture will take place on Saturday, April 7th at 3:00 pm at the Winnipeg Art Gallery (300 Memorial Boulevard). 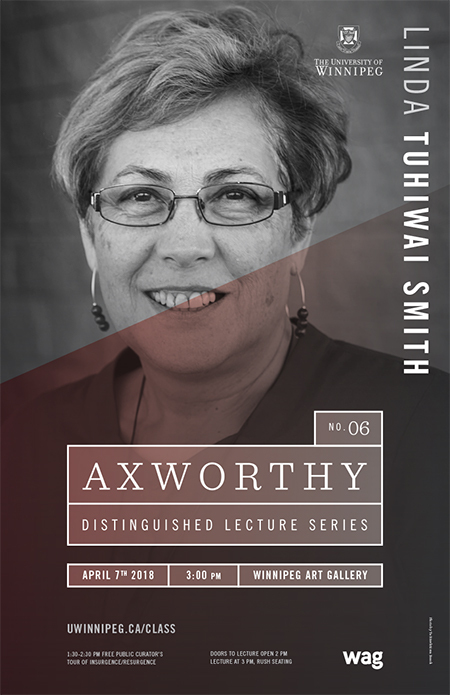 In partnership with the University of Winnipeg's Office of Indigenous Affairs and the Winnipeg Art Gallery, the Axworthy Lecture Series is honored to host the renowned Māori scholar, Dr. Linda Tuhiwai Smith, on April 7th, 2018. Doors open at 2:00 pm (free rush seating). The lecture beings at 3:00 p.m. Q&A to follow. The lecture will be preceded by a free public tour of INSURGENCE/RESURGENCE from 1:30-2:30 p.m.﻿﻿ ﻿The tour will be lead by co-curators Dr. Julie Nagam, UWinnipeg Chair in the History of Indigenous Art in North America — a joint appointment with UWinnipeg and the WAG — and Dr. Jaimie Isaac, WAG Curator of Indigenous and Contemporary Art. For more details about the Axworthy Lecture Series, please visit the series website at http://www.uwinnipeg.ca/class/axworthy-lecture-series.html. Dr. Linda Tuhiwai Smith of Aotearoa (New Zealand) is an internationally accomplished scholar and researcher who has worked in and influenced the field of Māori education and health for many years. Her groundbreaking book Decolonising Methodologies Research and Indigenous Peoples (1998) remains an international best seller, translated into Spanish, Chinese, Arabic, Italian, and Bhasa Indonesian. This seminal work is a foundational resource for critiques of the existing relationship between dominant institutional research protocols and Indigenous knowledge systems. It has led to many other authors publishing books that guide students, both Indigenous and non-Indigenous, today and into the future.